Jillian Chow · GenR8 - Marketing Evolved. 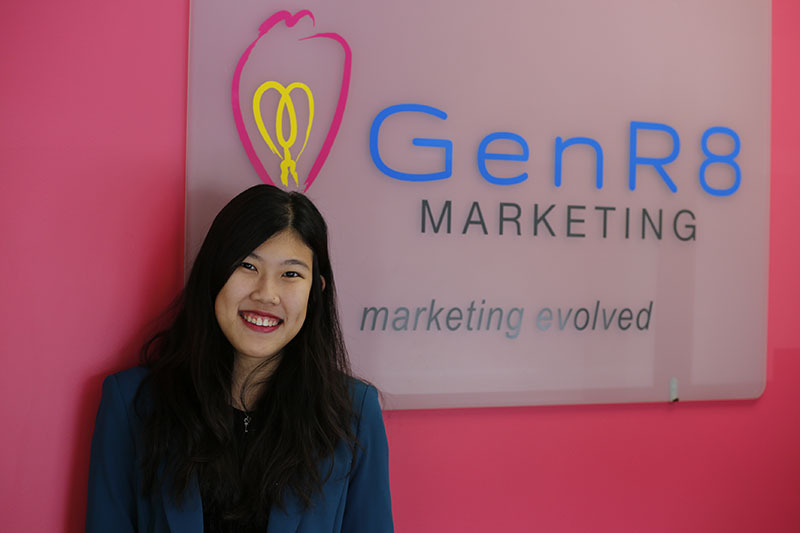 Jillian came to know GenR8 Marketing through her sister, Chelsie Chow. After meeting Jason and Holly, she eventually accepted their offer to join the team. Being with GenR8 has been an eye-opening experience for Jillian, as not only did it allow her to understand the dynamics of different businesses, but it also helped her grow as a person. She was able to gain new skills and try things that she never thought she would do, like designing and managing Google Assets for our clients. The fact that she hold different responsibilities here at GenR8 is what interests her the most, as she will never stop learning and she is always looking out for new projects. Work aside, Jillian is most of the time a social butterfly. She enjoys going out with friends and family and meet new people – almost three to four times a week. At home, however, she tends to binge-watch recent reality TV shows and drama series, in which can take up about half the day. A fun fact about Jillian is that she was involved in a music video and soda commercial with a Malaysian punk-rock band, Bunkface in 2016. She has to admit that this was one of the most random things that she has ever done in her life, but it was indeed an enjoyable experience to her.